That, Mr. Geoff Dowsett’s membership of the Hornsby Ku-ring-gai Greens should be cancelled on the grounds that the member has, as outlined clause section 6.5.3 of our constitution, "placed herself or himself outside of the Group" acted in contravention of clause 6.5.3.2 of our constitution, in that he demonstrated repeated disruptive behaviour within the Group and behaved in a manner that brought the group into disrepute. Due to the confidential and personal nature of specific incidents underlying this motion, the details of these events will only be discussed at the meeting." Geoff says that he rarely attends meetings, so he doesn't think that his alleged 'disruptiveness' could be about disrupting meetings. He says that he thinks that the objections are probably about his energetic, persistent lobbying, using emails and Facebook posts, addressed to Greens members and MPs. He has sometimes received responses indicating that some Greens see his population policy activities as insulting and counter to their ‘safe speech’ rules. The motion above cites Section 6.7 of the Greens NSW constitution. Geoff believes this has to do with sharing information to people such as Jane O`Sullivan and Sheila Newman who are not Greens members. At this stage he thinks this concerns sharing Mercurius Goldstein's response to a question he circularised to candidates and encouraged others to send similar questions about candidates’ attitudes on Australian population policy. It is hard to believe that there is a valid case against Geoff, but three members have apparently asked the secretary to arrange for Geoff's dismissal. Geoff says that he has frequently been abused by some Greens members who don’t like his views on population numbers. (We published Tamara Ryan’s response to Geoff here:http://candobetter.net/node/4935.) A few Greens members have persistently described him as a racist, xenophobe and, more recently, as sexist, publicly breeching Greens safe speech protocols but without reprimand within the party, he says. Geoff has distributed an email to hundreds of NSW Greens MPs and members suggesting that none of the candidates for John Kay's now vacant Upper House seat are sufficiently qualified to represent the environment, quality of life, fauna and flora, or habitat of NSW. He came to this conclusion from their poor responses or failure to respond to a relevant question he sent to candidates [see below]. He said that the responses to this email 'displayed no knowledge, interest or inclination to admit that the Turnbull Government's record, high, excessive, unsustainable 457 Visa and middle class immigration intake should be returned to the long term average of about 50,000 net per annum from the current excessive 500,000 net per annum.’ With regard to the move to expel him, he has said that the Greens should read his message rather than shoot the messenger. We will be watching with interest and concern to see whether Mr Dowsett suffers injustice for his environmental activism. As noted in other articles on this site, e.g. ”Greens members harassed for expressing valid views on environment and population”, he is not the first Green to be pushed around for sounding the alarm on how rapid population growth and the intensification and expansion of human activity is threatening native animal habitat and quality of life in Australia. Geoff runs eco-bushland tours around Sydney national parks which are threatened by encroaching population density and its associated infrastructure and footprint. His blog on candobetter.net is at http://candobetter.net/blog/324. Geoff says that he thinks he actually joined Hornsby Kuringai Greens about 10 years ago, but it could be more. He had been a supporter – letter-boxing – for instance and doing polling booth work for about 20 years. He was friendly with an old Greens stalwart, Mervine Murchie, a Scotsman with trade union background--- who convinced him to join. He finds that the Greens have changed a lot since then. They are very different. There were many more conservationists in the early days. Geoff says that he has attended many community meetings organised by Greens and only one State Delegates Conference. He has placed Greens candidate placards in his front garden during elections and he has two Greens placards permanently in his front garden. One is high up in a tree and the other in ground. Have letter boxed----and handed out at polling booths. Meeting is 12th Sept 6.30 pm. Thank you for this article. It is about the most important Australian issue of our time really and is at the root of all the environmental destruction going on. Australia will be a desert with buildings in our lifetime. I'm not surprised about the Greens. I left the party when Ms Hanson Young arrived, and joined Sustainable Australia but it did really badly in the election. Typical that the Greens bring up xenophobia. They are watermelons, and I've been told that by an insider years ago.
" I left the party when Ms Hanson Young arrived, and joined Sustainable Australia but it did really badly in the election." Surely most Australians would want a sustainable Australia, with a sustainable population size? The big growth we are experiencing is surely a threat to our environment, our stability and our prosperity? Unfortunately, the Sustainable Australia party is too quiet about the P word- POPULATION! Surely it is the "everything" issue, so why not be up-front about Population? Why not address directly the main source of our massive population growth - IMMIGRATION? Nothing is achieved by being PC, and trying to avoid the big ticket issues like "racism" and "xenophobia"? They are just falling into the Green's agenda by their silence. The party should be called the "Reduce Immigration" Party, and the media will surely give them more attention? They will trap them with questions, aimed to expose them as "racist", but publicity is good publicity, and "sustainable" is a bland, oxymoron that's easily dismissed these days - overused and meaningless! This was forwarded to me today from someone called, "Don". 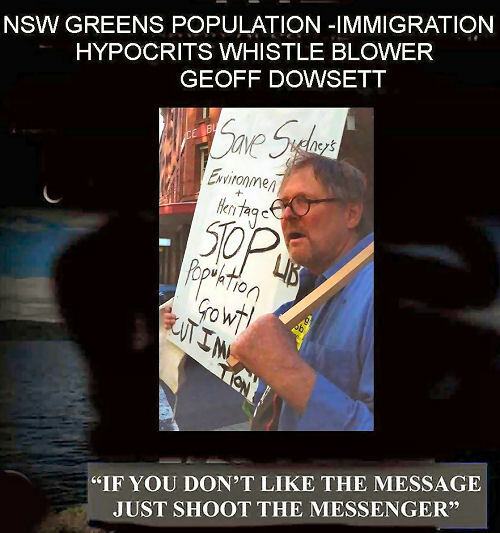 Don occasionally emails the Greens with information and you can see that the same sort of xenophobia to any non-tribal ideology continues to thrive among the Hawkesbury 'Greens'. There is so much money in population growth. "Don. Please stop emailing us. The Greens do not have a policy of sustainable population and nor should we. It's racist and does nothing to address consumption. It's white people in developed nations consuming too much that's the issue, not population. Sustainable population ideology includes women required to obtain reproductive licences to have children. We should never control women's bodies. Your emails are starting to be of a similar nature to someone who was expelled from the Greens NSW for similar views and incessant communications just like this one. I suggest your views may be better received with the Sustainable Australia Party. Stop emailing the Hawkesbury Greens. So the Greens are not even prepared to enter into debate or discussion on this issue - they threaten you with expulsion for raising 'heretical' ideas? There would be no need to 'license' the having of children in Australia, as the birth rate is about replacement rate of deaths. And the reason for this is precisely because WE DO control women's bodies - via 'The Pill'. ".......It's racist and does nothing to address consumption" [and] "I suggest your views may be better received with the Sustainable Australia Party." Australia is 90% desert/non arable, TOTALLY unsuitable for a population swarm. More people less wealth! IMMIGRATION PROGRAMME IS A CATASTROPHE - CLOSE IT DOWN - AUSSIES HAVE HAD ENOUGH!! b] Dismantle the Federal Government Department of Immigration and all its ancillaries. c] Abolish any other Government, or public body that advances immigration. d] Refuse the demands of big business/ money changers for immigration to force exponential “growth” driven profits. e] Abolish migration agents, migration lawyers, and migration do gooder organisations. f] Advance non materialist values of Australian culture. Scrapheap multicultist pox and its promoters. g] Introduce population criteria into future directions. 2a] Direct for National self-sufficiency objectives in ALL commerce and industry. b] Develop free enterprise Steady State economic goals and outcomes. d] Ownership of Australia to be taken back by and for Australians. Foreign imperialists/ lackeys ejected! e] Introduce Citizens Initiated Referenda and Parliamentary Recall, re-empowering Individuals of The Commonwealth with authority over the political process, lifestyle, and the purpose for a High Culture. Join the fight to reclaim our Australia!